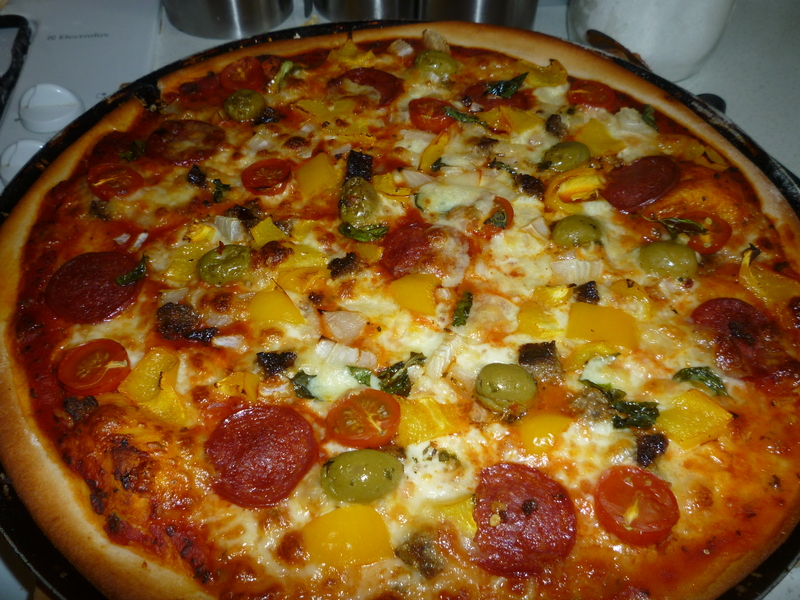 I am pleased to say that fresh pizza is a regular feature in our kitchen as I am a pizza addict. I hope to build my own outdoor wood fired oven for pizzas, bread and other delicious treats. 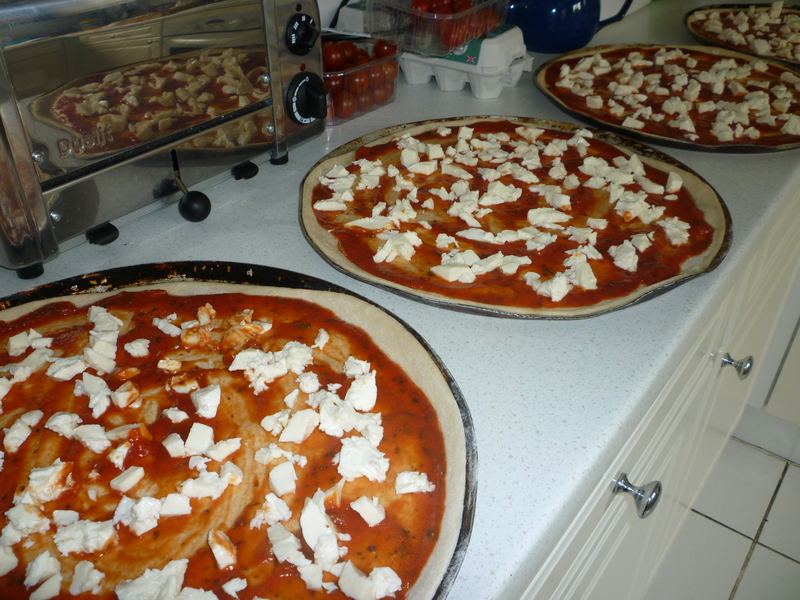 I have been making pizza for over 20 years and therefore play around with the dough, sauce and topping preparation depending on desired outcome. All I will say is that using a bread flour is always better although I have used plain or all purpose flour before without complaint. This will make 4-5 large thin pizza bases. Dissolve sugar in water and add yeast and mix well (you can use fresh yeast also). Pour into flour and salt an knead for 10 mins. I have used a large bowl, the kitchen counter as well as a Kitchenaid mixer. 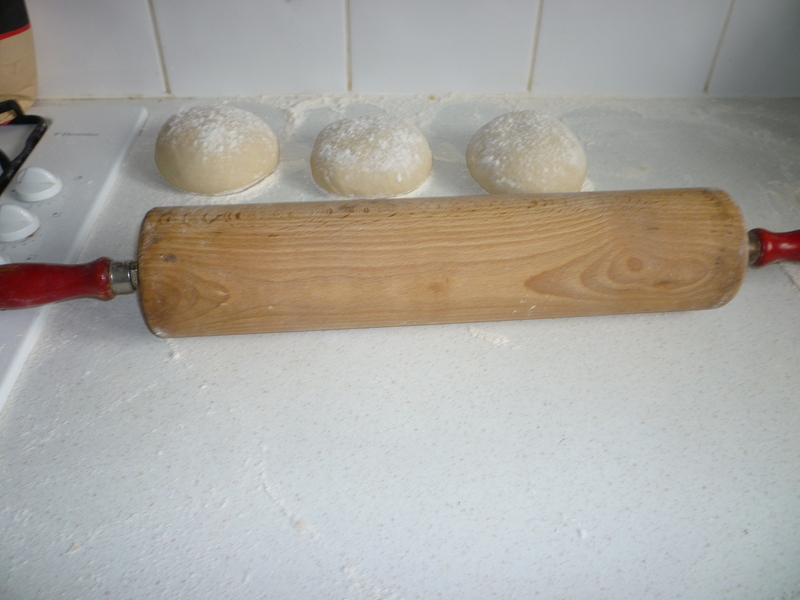 Whatever equipment you have just work the dough until it is smooth and silky. Too wet- add flour; too dry – add warm water. Cover in a bowl and prove for 1 hour in a warm place; I sometimes drizzle with oil at this stage. 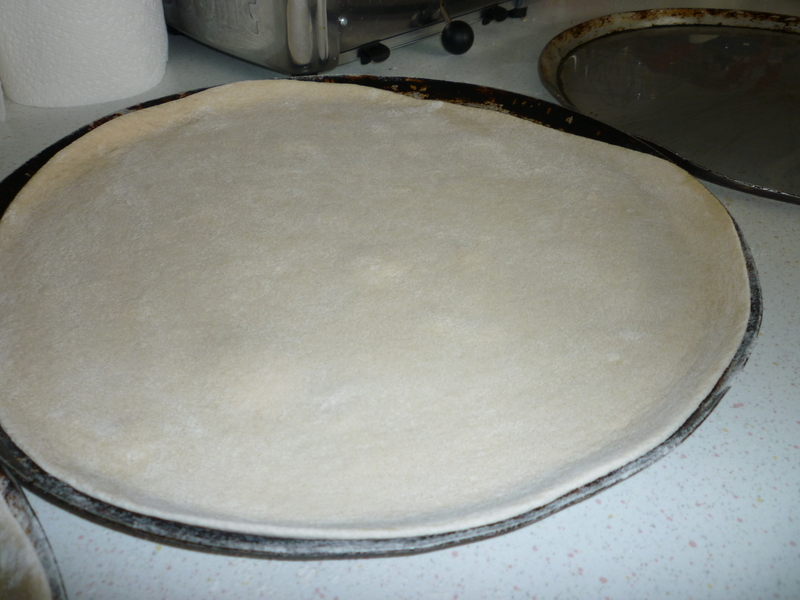 Portion out and shape into smooth mounds then roll / stretch to fit your pan. Then you are free to unleash your inner topping demons. I am an anchovy, olive and chilli (flakes/jalapeño/habanero) nut but I guess not everyone shares my passion for such strong flavours. Garden salad and some coleslaw made sure these bad boys slipped down nicely. I do love a good pizza. As I said there is scope for you to mess around and tweak the dough recipe. 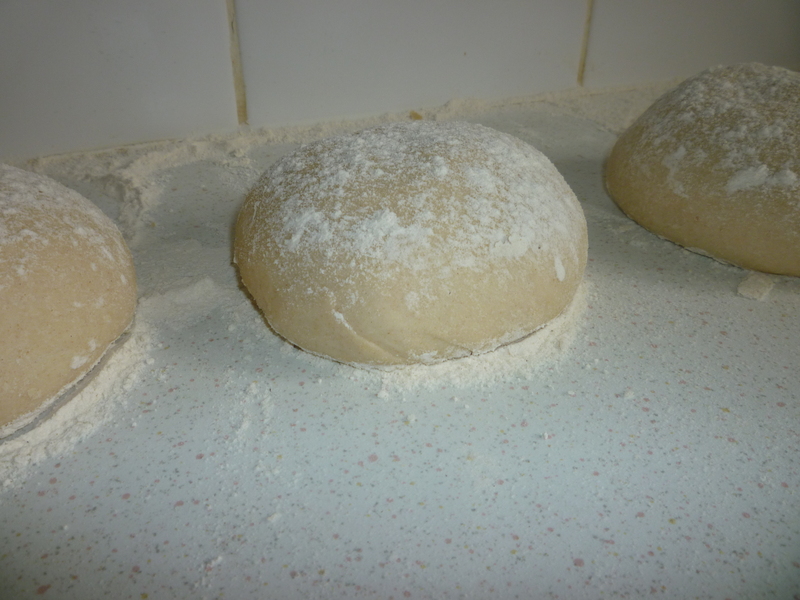 I have added varying amounts of oil, milk, garlic, rosemary etc to the dough before proving. What would you add or change? I would change the oven….. soon come. 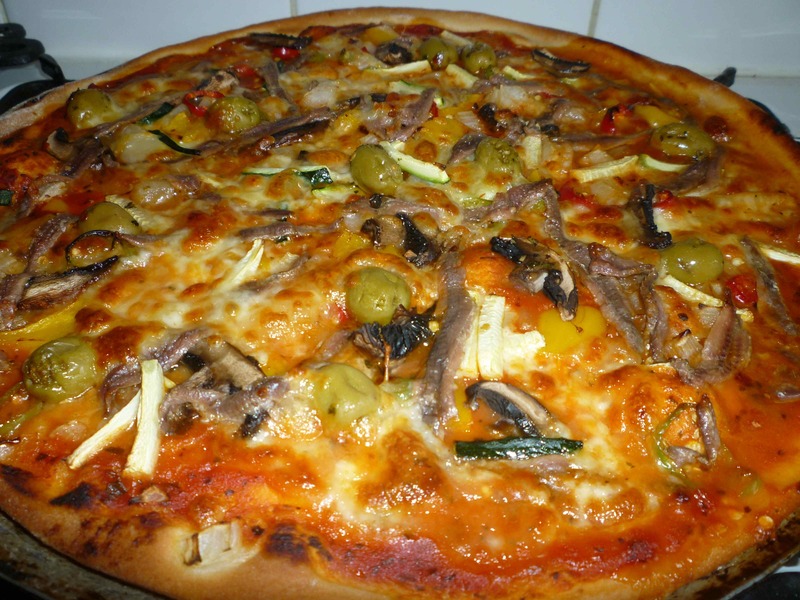 This entry was posted in Cheap nosh, Home made, Recipe and tagged cheap as chips, Dough, home made, Kitchenaid, Pizza by Julian. Bookmark the permalink.